I Just Finished The New Ace Attorney. It Was Fantastic. Ever wanted to know what Ace Attorney would be like if it took place in 1901? Well, if you speak Japanese you can—and it’s awesome. The setting is the unquestionable star of Dai Gyakuten Saiban: Naruhodo Ryunosuke no Boken. The game takes place in Japan, London, and on the high seas at the turn of the last century. It is a time before cars, planes, movies, and computers. Technology, as we think of it, is in its infancy—which means that crimes aren’t solved by science, but rather by deductive reasoning. In other words, this is the perfect setting for a game like Ace Attorney where everything comes down to finding the contradictions in witnesses’ statements. The story follows Ryunosuke Naruhodo, ancestor of Phoenix Wright and defense lawyer in training. A college student, he finds himself accused of the murder of Professor John H. Watson—a name you might recognize—and decides to represent himself in the trial. The next case isn’t a trial. Instead it’s a murder on the high seas—strikingly reminiscent of the Sherlock Holmes short story The Adventure of the Speckled Band. And it’s all the more fitting when you meet the world famous detective in the flesh in this very case. Unfortunately, Sherlock Holmes, as portrayed in Ace Attorney, is kind of a dunce. One of the title’s major new game mechanics is listening to his theories about how and why a crime or other incident happened and then step-by-step proving him wrong. He is a far cry from the world’s greatest detective you’ve come to know from the classic stories or popular culture. However, upon arriving in London, you meet his partner in crime fighting, Iris Watson—his 10-year-old genius roommate and writer of all the Sherlock Holmes stories (in the Ace Attorney universe anyway). She’s the creator of much of the game’s steampunk technology and is every bit the deductive prodigy that Sherlock isn’t. 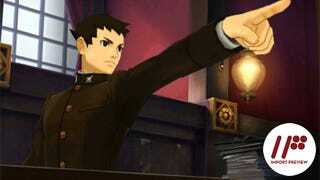 But, of course, the real action in any Ace Attorney game is found not in the investigations, but in the courtroom. Like in all the core games of the series, the majority of the gameplay revolves around listening to each witness’s statement, pressing for more information, and then objecting if what he or she says contradicts the evidence. Borrowing from Professor Layton vs. Phoenix Wright: Ace Attorney, you often interrogate several witnesses at the same time. While not really possessing a special power like Phoenix or Apollo, Ryunosuke is adept instead at watching witnesses other than the one talking to see when or if they are surprised by the current testimony. By keeping a careful eye out, you can drag out new information by interrupting the testifying witness and confronting the surprised one. But the biggest new addition to the trials is the jury system. Each case in England has six jurors watching the case. At any time, a juror can announce that he or she is convinced of a defendant’s guilt or innocence by launching a fireball onto one side of the scales of justice or the other. If at any time during the trial all six jurors believe the defendant to be guilty or innocent, the trial enters a kind of sudden death. During this time, the losing lawyer has one chance to convince the jury members to change their votes. When this happens to Ryunosuke (which it does more than once), you listen to the jurors’ short statements about why each thinks the defendant is guilty. Then you try to find two statements that contradict each other and bring the misunderstanding to light—hopefully causing them to change their votes in the process. This mode adds a whole new layer of tension to the gameplay—where in an instant a particularly damning piece of evidence can take you from certain victory to the brink of defeat. Honestly, coming back from this each time feels like a major accomplishment. The other interesting twist in both story and gameplay in Dai Gyakuten Saiban is that you never know for sure if your client (or anyone else) is innocent or guilty. In past games, Phoenix, Apollo, Athena, and Edgeworth each have some special item that lets them see if someone is lying or not. Ryunosuke has no such crutch to fall back on. So even as you continue working hard throughout the trial to find the identity of the true culprit, there is a chance that he or she may actually be the one you are defending. It’s a great little addition to the game’s formula. All in all, Dai Gyakuten Saiban: Naruhodo Ryunosuke no Boken is a solid Ace Attorney title. Its low technology, turn-of-the-century setting is perfect for Ace Attorney-style mysteries; and partnering up with Holmes and his little Watson is great fun (even if proving Sherlock wrong again and again makes him look a bit foolish). 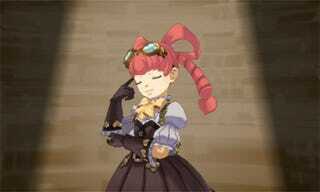 Add to that the jury system trials and it is certainly the best built of the Ace Attorney games on the gameplay side. Honestly, it’d be a shame if this is the last we hear of Ryunosuke Naruhodo—but even more of a shame would be if the game never left Japanese shores. Dai Gyakuten Saiban: Naruhodo Ryunosuke no Boken was released in Japan for the Nintendo 3DS on July 9, 2015. There is currently no word on a Western release.